This Bellin map is based on de l’Isle’s important map centered on the Mississippi River. The map was published under two different titles, this one being the rarer of the two. 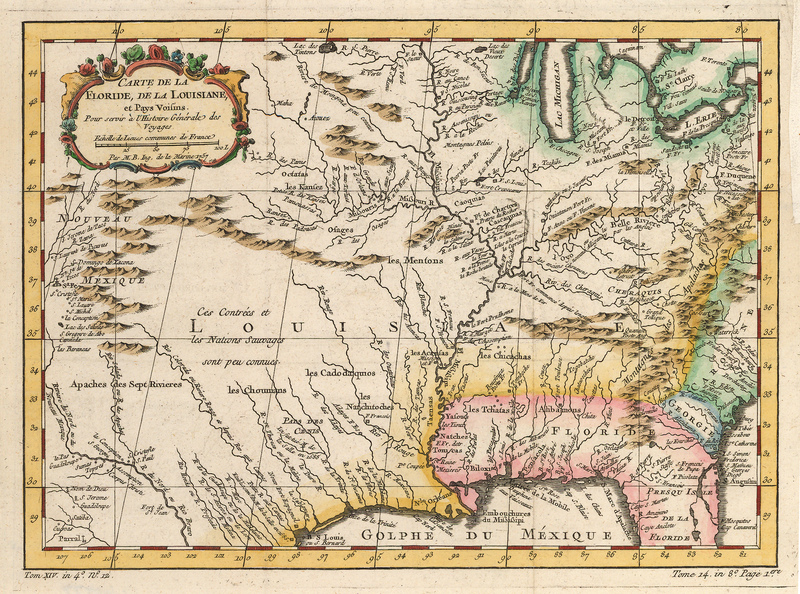 The more regular title for this map is Carte De La Louisiane et Pays Voisins. The map covers a wide swathe of the territory which was to later become the United States. Compiled less than twenty years before the Revolutionary War, the map provides marvelous detail of the interior of the US on either side of the Mississippi, and from the Great Lakes to the Gulf of Mexico. Countless indigenous Indian tribes’ names and territories are noted in detail, along with the note in French in the center of that territory stating that the area was not well known. In addition to the Mississippi other rivers both great and small which empty into the Gulf of Mexico are noted. Numerous early French forts are indicated. The Appalachian Mountains are present, and early names which became state names are denoted. The exploration and settlement west of the Mississippi is also represented by forts, Native American villages and other place names. The map highlights the unknown region in Northern Texas and the Native American Territories, between the Mississippi and Rio Grande. The first settlements west of New Orleans along the Gulf Coast and the interior of Texas are shown. Condition: This finely colored map is in A condition with margin added to the upper right corner for framing purposes.